"I think we're both just… trapped under the same spell." Locus Animation has debuted an official trailer for the new animated film Red Shoes & the 7 Dwarfs, a twisted new take on the Snow White fairy tale. This was made in Korea by a Korean filmmaker, but features English voices to reach a wider audience worldwide. Chloë Grace Moretz stars as the voice of Snow White, along with a cast including Sam Claflin, Gina Gershon, Patrick Warburton, Jim Rash, and Frederik Hamel. Moretz spoke out about this project a few years back, when the marketing was accused body-shaming. Now it seems they've switched things up a bit. Princes who have been turned into Dwarfs seek the red shoes of a woman in order to break the spell, although it will not be easy. Described as "a parody with a twist," of course. Alas, this just doesn't look good. Red Shoes and the 7 Dwarfs is a retelling of the classic Brothers Grimm fairy tale. This time, Snow White finds a pair of magical shoes that transform her into a classically beautiful princess, and she encounters the seven dwarfs, who need a kiss from the most beautiful woman in the world to undo a curse. In the course of their journey, all come to realize the true meaning of beauty. 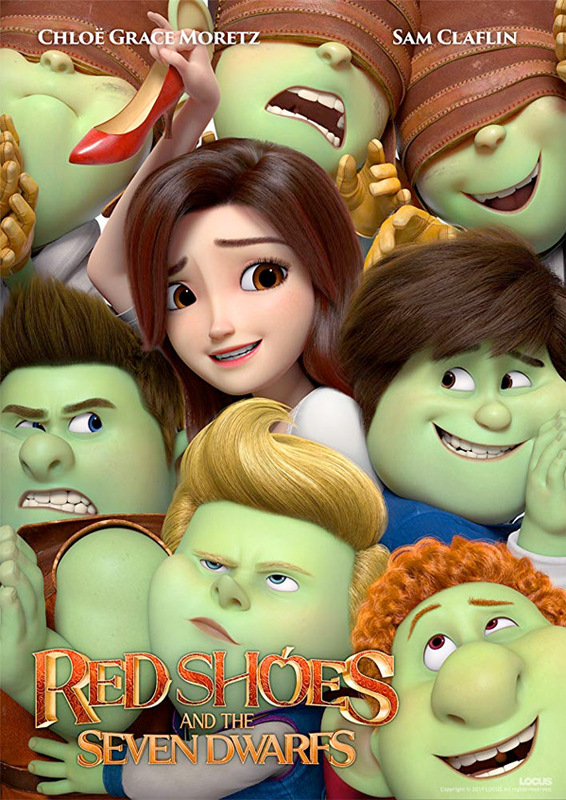 Red Shoes & the 7 Dwarfs is both written and directed by Korean animator / filmmaker Hong Sung-ho, making his feature directorial debut after working in the visual effects industry and directing a short film (Egg-Cola: A Miracle in the Desert) previously. Produced by Locus Animation, with Kim Jin as animation director. The film still doesn't have an official US release date set yet, but we expect updates soon. Stay tuned. First impression? Who's interested?